gOS: gOS & Cloud: What's the difference? gOS & Cloud: What's the difference? When we first started the company, we had a single product: gOS. Last week, we introduced our second product called "Cloud." 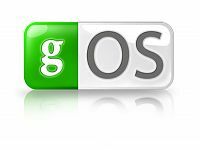 I noticed that a few articles reviewing Cloud used screenshots of gOS, and might have assumed that gOS and Cloud were the same operating system, when in fact they are different operating systems. So what's the difference? gOS boots a full desktop with full suite of rich client applications, such as Firefox, OpenOffice, Media Player, etc. The user sees a desktop and uses it as a desktop. When buying a computer, you could buy a computer with just gOS installed as the only operating system. Cloud boots into a browser environment that's designed for faster access to web applications, such as Google Calendar, Documents, etc. The user sees a browser and uses it as a browser, with extra features that most browsers don't have such as "Powering Off" or "Switching to Windows." When buying a computer, you could buy a computer with Cloud and Windows installed together. cloud? is it stripped-down debian? how did you achieve 5 seconds boot-time? can i open terminal and use apt-get to install linux apps? Thank you for the clarification. Hope a "beta/RC" available to public for testing soon. Just wonder how does this compare to Phoenix Hyperspace. To Oren. If its publicly released isn't it required to be open source? only nonpublic private versions don't need to be open source. By looking at the pictures I noticed that the browser looks like Google's Chrome, but I know Chrome is currently not available for Linux (but will be soon), so does this mean it will be based on Google's Chrome browser or is it FireFox with Google's Chrome skin? You can use Chrome on gOS through Wine & you can use Chromium thanks to Crossover. IMHO it launches slow but hey, its whats available. I currently use Opera with Chrome's skin /:p. Just to complete the gOS' Google theme theme on my Eee 900. I need a download of this, pronto! When with this be available for download? When will this OS be available for the Cloudbook that I have that runs the older version of gOS? I cannot update my gOS without crashing it, so an upgrade of the OS is due for this smaller, micro-laptop. Please advise when such an upgrade is available for download, and burning. Until then, I'll have to continue using Windows Vista until such a upgrade is provided. What will your next product name be, Web2.0, or maybe even AJAX!!! Couldn't you guys be more original, instead of using tacky buzz words and leaching off of others trade names. gOS? Come on, talk about an intentionally misleading product name. It's just a linux distro. You even make it sound like you guys built WINE. And now "Cloud", with screenshots of Chrome. This is really bordering pathetic. Does anybody take you guys seriously, oh wait, you just partnered with GIGABYTE! I had one of their boards like 10 years ago. A quick question to end a rant: Do you guys actually build your own software, or just recompile other people's and take all the credit? I think that is a pretty bad idea. You want to sell a browser on top of Windows as the Cloud OS? gOS 3.1 was closer to the target. The whole windows compatibility is an obsolete requirement, in particular for Netbooks as most users won't install software there anyway. The reason why you use Linux whatever is that you are safe from viruses and worms. Looks like an interesting idea. I hope its marketable. I don't use Windows, but could see this being a great quick way to boot up a laptop for simple things rather than waiting for a full boot. I don't know what platform you're using, but seems like something that would fit well with Linux distros as well. Hello. Please delete this message. I’ve been reading the section for quite a long time but was feeling shy to register. I’ve been browsing through the section for quite a long time but was feeling shy to register. today some new emo links for you! I need to contact site admin urgently. Can you understand me?